The Rocky Moutains are probably the most imposing mountain range in North America and one of the main symbols of the American Wild West. It features a great deal of beautiful, well-known landscapes, is home to a diverse amount of rare and less rare wild animals and can also be considered as a linguistic bareer in terms of differences between accents and dialects from the West and the East of America. The Rockies are located in the Northern part of America, going through the counties of British Columbia and Alberta in Canada and through the states of Montana, Wyoming, Idaho, Colorado, New Mexico and Utah in the USA and result from the tectonic activity and erosion of glaciers 80 million years ago. The Rocky Moutains are 4828 km long and 480 m wide at the widest with their highest peak located on Mount Elbert in Colorado, reaching 4398,26 m. As mentioned before, they feature a great deal of uncommon animals such as the grizzly, black bear, rare lynx, mountain lion or the pika but also some more common such as the moose, the caribou and the deer. They also have a rather diverse flora with plants and flowers such as the alberta white rose, Canadian goldenrod, buttercup or the alfalfa. In such a large area, there are many places and activities to discover which are not to be missed. First of all, the lakes. The Rockies contain a little more than 80 lakes. 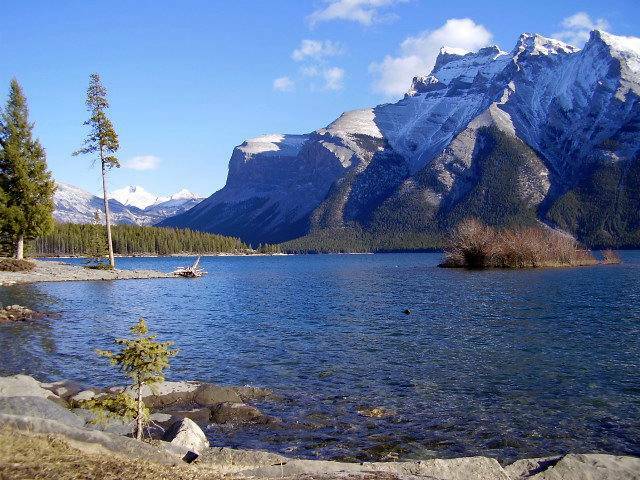 Some of these are more known than others such as The Moraine, Minnewanka, Peyto and Maligne lakes. However the lake Louise situated in the national park of Banff remains the one that has been nominated as a must-see destination in the world. The landscape over there can just keep you amazed for hours. Secondly several great parks such as the Yellowstone and the Rocky Mountains National Park. The former is the oldest national park of Canada incorporating 10000 hot springs and geysers and the latter is prized to go hiking right in the middle of the most beautiful wildflowers and animals. Rightly, most of the mountain range is now protected by the National Park status. After visiting the most beautiful places in the site, there is no shortage of activities to keep you occupied. In the winter you can skating on the frozen lake, skiing, snowshoeing enjoy a dog sledding tour, playing hokey or to take part in a snowball battle. In the summer canoeing, fishing, mountain hiking, river rafting, swimming and so on. The Canada is also well-known to be a place that brings together fans of extreme sports. To do Bungee jumping or sky diving in the Rockies can only be a unforgettable experience ! At last if you are not fond of sport to appreciate ice sculptures at the Colorado Ice Festival in January or to go to the Kaslo Jazz summer festival in July to dance and drink coktails the whole night can be suitable for you. If you want to go there have a look like I did at the ESL club which is an organisation that coordinates a lot of different trips such as the Christmas Tour or the New Year, Winter, Summer and Ultimate Tours. For example the classical one which is the one that I did: You will start by taking a bus from Vancouver that will bring you to Alberta, a province of British Columbia. I was with some friends from my international school of Vancouver so I was not alone, I also met a lot of people there, it was amazing to discover some new culture. There Esl offers 5 days on-site for the price of 335 dollars which is equivalent to 223 euros. It includes 4 nights accommodation incorporating 1 night right in the town of Banff which is one of the most famous town of the Rocky Mountains and 4 breakfasts. You will for sure discover some of the most amazing places through the most beautiful parts of Canada and never forget it. You will doubtlessly benefit of the knowledgeable and friendly Canadian guide who will make this trip one of your best ever. I have seen some beautiful places in the rocky mountains and some were the most fabulous that I have ever seen. If you don't know where to go for your holidays you really should go there because visiting The Rockies was a breathtaking experience.